Each year at it's Annual Meeting, Flexible Pavements of Ohio recognizes projects that demonstrate exceptional quality in construction and awards them the Quality Seal. Photo: Monroe Local Schools K thru 12 Educational Facility. 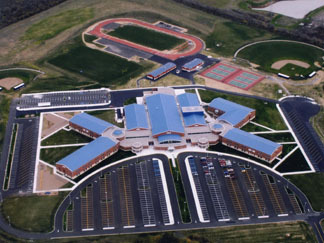 Barrett Paving Materials, Midwest Central Region built the project for the Monroe Local Schools with their designer, Steed Hammond Paul. This project consisted of the new construction of service roads, parking areas, running track, and tennis courts. Meticulous placement was demanded due to areas that were very grade and slope sensitive. Over twenty nine thousand tons of hot mix was necessary to complete the asphalt paving work.